Every poultry farmer will love to see his/her birds doing well every day. What mostly scared some people away from poultry farm is the outbreak in the farm. It gives joy and memorable when you want to feed your birds and each and everyone of them will fighting to feed before others. As a poultry farmer how do you feel when that happened? only laying, they lay big eggs too. if your birds bring down diseases? But don’t worry there are solution for that and your happiness will continue. Just make you know how to control this enemies am about to tell you now. There are common diseases you need to know about and how to handle it. I fear this disease more any other disease because of the it highly contagious viral neoplastic disease in chicken. 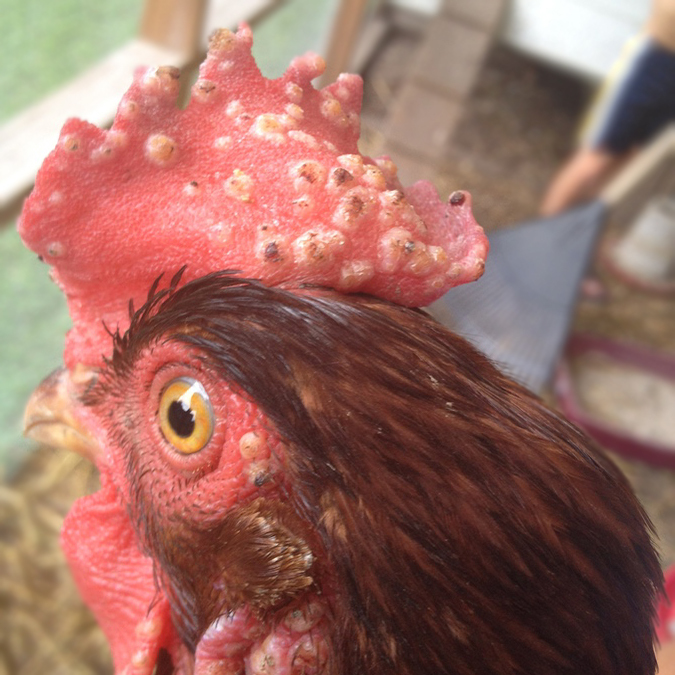 Marek’s Disease (MD) is a viral disease that affects chickens and it causes tumor. This disease affects only female chickens and occurs in chickens between 6 to 20 weeks of age. Marek’s disease is highly contagious and can be transmitted from an infected bird to uninfected birds or through the air. Signs and symptoms: Paralysis of the legs and wings. In the classical form of Marek’s disease, the affected chickens lie on their side with one leg stretched backward and the other leg stretched forward. In the acute form, many chickens die suddenly without showing any sign of illness while some chickens show paralytic symptoms and appear depressed before dying. Other signs include paleness, loss of weight, shrunken comb and diarrhea. Treatment: Marek’s disease has no treatment, but to avoid the incidence of MD, day-old chicks must be vaccinated against the disease. This is another enemy that gives me sleepless night about poultry farming, if you don’t find out about this disease in time your name is sorry because it will send all your birds to the land of their ancestors in blink an eye. 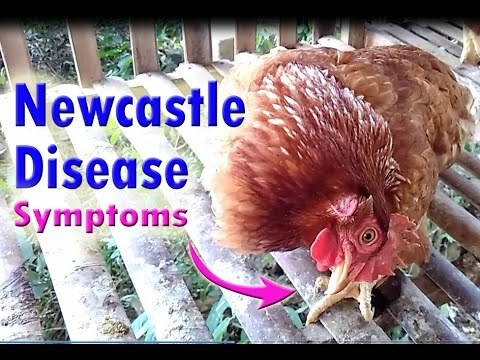 Newcastle disease (also known as Ranikhet disease) is a viral disease that is caused by paramyxoviruses. These viruses are of various types. There are the very harmful type, moderately harmful type and mildly harmful type. This disease can be transmitted through the air, feed, water and carrier birds. Signs and symptoms: With very harmful paramyxoviruses, the first sign is sudden death. Other signs like weakness, depression, greenish diarrhea, lying down, swelling of the face and nervous signs will also be observed. Torticollis (twisting of the neck), leg paralysis, arching of the body are some other indications of Newcastle disease. In layers, laying of soft-shelled or shell-less eggs is an early sign, followed by totally halting of egg laying. Moderately harmful paramyxoviruses are responsible for severe respiratory problems. In adult chickens, there is usually obvious decline in egg production for many months. However, the mortality rate is low. The mildly harmful paramyxoviruses may not cause any disease or just a mild respiratory problem. Treatment: Newcastle Diseases has no treatment, but can be prevented through vaccination, maintaining a high level of farm hygiene, good management and biosecurity measures. This is a rapid, sudden and high contagious viral poultry disease. It’s caused by a coronavirus and could be transmitted through the air, contaminated materials and carrier hosts. Signs and symptoms: Abnormal respiratory sounds, snoring, gasping, sneezing and coughing, watery nasal discharge, ocular discharge and swelling of the face. Reduced egg production and poor eggshell quality. Treatment: Infectious bronchitis has no specific treatment, but you can administer antibiotics in mixed infections. You should also take affected chickens to a warm, dry place to recover. Some farmers have tried warm herb tea and fresh herbs, and they claimed they worked. To prevent Infectious Bronchitis, vaccinate your chickens against the disease and maintain proper ventilation of chicks. Fowl pox is a viral disease that could be transmitted through body wounds or scratches, a vector carrying the virus (e.g., mosquitoes) and through the air. Signs and symptoms: If you notice something like pox lesions on wattles, comb and/or legs, discharge from nostrils, white ulcers or cheesy membrane in mouth, loss of appetite, decline in egg production, foamy materials in corners of eyes or white spots on the skin, your chickens are undoubtedly developing or already down with Fowl Pox. Treatment: Since this is a viral disease, there is no exact drug. However, you should remove the necrotic membrane from affected chickens’ mouth and larynx. You can stimulate appetite with wet feed (mash) and add antibiotics and multivitamins to their drinking water. Ensure that you use good disinfectant during the outbreak of the disease. To prevent Fowl Pox, you need to vaccinate your chickens with Fowl Pox vaccine and control mosquitoes in and around the chicken coop or pen. This is a serious disease caused by the botulism toxin produced by the bacterium Clostridium botulinum. The disease affects the nervous system of chickens, causing body weakness and paralysis. Chickens can pick up the disease when they drink water or eat feed that has been contaminated with botulism toxin. Signs and symptoms: If you notice that your chickens have progressing tremor that later develops into a paralysis of the body and breathing difficulty. The feathers pull out easily and the affected chickens die within a few hours. Treatment: Administer an expensive botulism antitoxin from a vet drug store. If you’re able to diagnose or detect the disease early, mix one (1) teaspoon of Epsom salts with 3 cl of warm water. Administer the solution to the affected chickens once a day. To prevent botulism, always maintain good farm hygiene and sanitation. Avoid feed and water contamination and all dead carcasses should be buried far from the chickens’ pen or environment. Fowl Cholera is a highly contagious bacterial disease that affects poultry birds. It is caused by Pasteurella multocida and could be transmitted through ingestion of contaminated food and water or from a carrier host chicken. Signs and symptoms: Yellowish or greenish diarrhea, difficulty in breathing, swollen joint, purple comb and wattle, oral, nasal and ocular discharges, ruffled feathers and loss of appetite. Treatment: Fowl cholera can be treated with penicillin, streptomycin, erythromycin, tetracycline and sulfonamides. You will need to administer drugs for long-term because the disease usually returns after stopping medication. To prevent Fowl Cholera, administer F. Cholera vaccine and maintain a high level of farm hygiene and sanitation. Prevent rodents, cats and wild birds from gaining access to the pen. Infectious Coryza or Fowl Coryza is a severe respiratory disease that affects chicken and it could be sudden. This disease is common in layers and broilers and it is caused by Haemophilus paragallinarum. It could be transmitted water contaminated with nose discharges, through the air, or through direct contact with an infected chicken. Signs and symptoms: Swelling of the head (comb, wattle and eyes), sneezing, stringy discharge from the nose and eyes, conjunctivitis with closed eyes, difficulty in breathing and moisture under the wings. Other symptoms of infectious coryza include reduced feed and water consumption and huge drop or halt in egg production. Treatment: Infectious Coryza can be treated with antibiotics and sulpha drugs. Oxytetracycline, enrofloxacin, trimethoprim and sulpha drug can be combined to treat infectious coryza. Chickens can be protected from infectious coryza through vaccination. Dispose all infected chickens or those that had recovered. Sanitation and hygiene and avoid keeping chickens of different ages together. The thrush in chickens is similar to baby’s thrush. It can be contracted by chickens that eat feed or food that has grown moldy; that is, moldy feed or food. They can also contract the disease by drinking contaminated water. Signs and symptoms: White oozy substance inside the crop of infected chickens. Increased appetite than normal. Lethargic appearance, crusty vent and ruffled feathers. Treatment: Thrush can be treated by administering an anti-fungal drug. To avoid future occurrence or reinfection, discard bad or moldy feed or food and contaminated water. CRD is a mycoplasmal disease caused by Mycoplasma gallisepticum, and it affects the respiratory tracts (including air sacs) of chickens and other birds. CRD can be transmitted through hatching eggs, direct contact with carrier birds and through inhalation of contaminated droplets, dust or feathers. Signs and symptoms: Abnormal respiratory sounds, sneezing, nasal discharge, coughing and sneezing. Reduced feed consumption, loss of body weight and decreased egg production. Treatment: Chronic Respiratory Disease can be treated with several antibiotics. Tylosin, oxytetracycline, streptomycin, neomycin, chlortetracycline, gentamicin, tiamulin, enrofloxacin, lincomycin, erythromycin and other related drugs can be used to treat CRD. Pullorum disease is a bacterial disease that is caused by a bacterium called Salmonella pullorum. The disease is highly contagious and affects the blood of chickens, but characterized by white diarrhea. This is the reason why pullorum disease is also called Bacilliary White Disease (BWD). It can be transmitted through the eggs, contaminated feed, water, litter and faeces. Signs and symptoms: Depression and unusual huddling together, respiratory distress, white and sticky faecal droppings, loss of appetite, pale, shrunken combs with ruffled feathers and decline in egg production. Treatment: Several antibiotics can be used to treat pullorum disease. However, furazolidone is recommended. Pullorum disease can be controlled by good biosecurity measures and ensure you procure your chicks from a reputable hatchery. Bumblefoot is an infection that is caused by staphylococcus bacteria and it is usually the aftereffect when your chickens get their injured foot infected by this bacteria. The foot of the affected chicken swells up because of infection. The cut or injury to the foot could occur when the chicken is scratching the floor or a sharp object. The only way to treat Bumblefoot is by performing surgery. It involves using a biopsy or scalpel to cut out the scab and removing the underlying infected core. After removing the core, drain the pus and soak the infected foot in warm water and Epsom Salts. Dry the foot with a clean bath towel and apply honey or any microbial and Vetericyn VF. Cover the area up with gauze and wrap with vet wrap to lock the bandage. If bumblefoot infection is left untreated, the affected chicken may become completely lame and could also die after other tissues in the body are affected. The best way to prevent bumblefoot is to keep a close watch on the feet of your chickens. If you observed that there is a cut on either of the feet, don’t hesitate to wash and disinfect the foot to prevent it from becoming septic or infected with staphylococcus bacteria. Coccidiosis or Cocci in poultry is an important protozoan disease that is capable of wiping out a large of number of affected chickens overnight. Coccidiosis affecting poultry birds include Eimeria tenella, E. necatrix, E. maxima, E. mivati, E. mitis, E. brunette etc. It is easier or better to prevent than to cure it because a poultry farmer may not be aware that his birds have coccidiosis until it is very late. Unfortunately, he might have lost a good number of chickens. This is the reason why a poultry farmer needs to know what to look for and what is needed to be done. Coccidiosis is a protozoan disease that infects the intestine of poultry birds like broilers, layers, turkeys and other animals. This disease can cause damage to the host bird within 4-7 days as the Eimeria parasite replicates and damage the intestinal mucosa of the host within this period. This disease starts when poultry birds (broilers, layers or turkeys) ingest relatively many sporulated oocysts of the parasite. These oocysts are present in litter, contaminated feed, soil, dust and water. Furthermore, these oocysts can be transmitted by insects, clothing, pen materials or equipment or in the faeces of infected birds. However, fresh oocysts are not harmful or effective unless it is sporulated, and this could happen when the environmental temperature is around 70°–90°F and with adequate oxygen and moisture within 24-48 hours. Depending on certain environmental factor, sporulated oocysts may survive in the sporulated form for long periods and they are resistant to some disinfectants but could be destroyed by high temperatures or freezing. please don’t forget to subscribe to our newsletter for us to serve you better.